Electronic cigarettes are so popular that the Oxford Dictionaries Word of the Year for 2014 was "vape" – "to inhale and exhale the vapor produced by an electronic cigarette or similar device." Their rising popularity is shrouded in controversy. And the stakes are high. According to the World Health Organization (WHO), 1 billion preventable tobacco-related premature deaths are at stake in the 21st Century, while 100 million people were killed by tobacco in the 20th century. 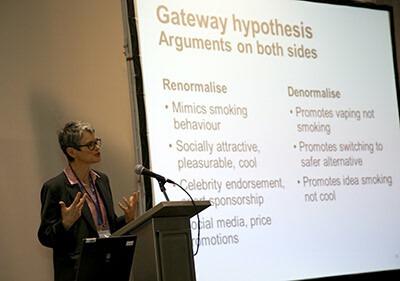 In light of widespread tobacco addition, are e-cigarettes a panacea or are a problem in themselves?That question was tackled this month by experts at the American Association for the Advancement of Science (AAAS) Annual Meeting in San Jose, California, in a symposium called "E-Cigarettes: Killing Me Softly or Our Greatest Public Health Opportunity?" The panelists were Dr. Wilson Compton, Deputy Director of the NIH National Institute on Drug Abuse; Dr. Kevin Bridgman, Chief Medical Officer and Director of Compliance of Nicoventures, a subsidiary of British American Tobacco; and Deborah Arnott, Chief Executive of Action on Smoking and Health, a British based charity established in 1971 by the Royal College of Physicians that is dedicated to eliminating the harm caused by tobacco. 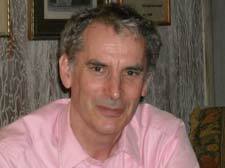 Dr. Julian Kinderlerer, President of the European Group on Ethics in Science and New Technologies, was the moderator. 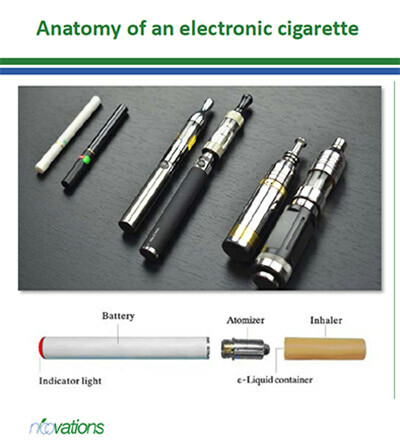 E-cigarettes were invented in China in 2003 by a pharmacist named Hon Lik, a smoker who invented the device after his father died from lung cancer. They have been in Europe since 2006 and in the U.S since 2007. There is little regulation and hundreds of manufacturers. Increasingly, tobacco companies are looking to e-cigarettes as a source of revenue to offset their losses of sales revenue of traditional cigarettes and to capture their share of the market. The nation's largest tobacco company, Marlboro-maker Altria Group, has its own brand, the MarkTen, available and classic and menthol. And the public is not waiting. 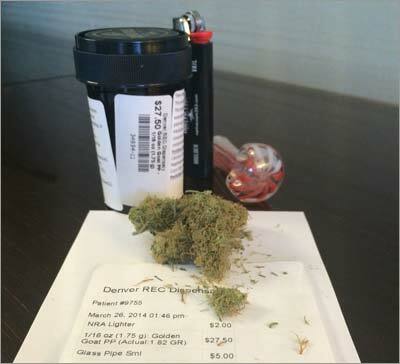 Despite a lack of certainty over the safety of e-cigarettes, panelists noted, tens of millions of smokers have made the switch, and e-cig shops are springing up like marijuana shops in Colorado. 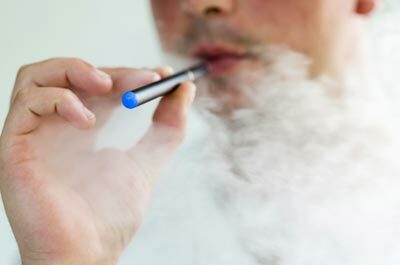 According to a report on vaping by NBC News, sales of electronic cigarettes were estimated at $2 billion dollars in 2013. Are e-cigarettes "safe" or simply "safer' than classical cigarettes?" Does their nicotine-infused vapor risk developing cancer in certain types of human cells in the same way that tobacco smoke does? Are e-cigarettes a gateway to smoking and drug use for teenagers? Dr. Compton gave an overview of how nicotine affects the brain. He said addiction is a developmental disorder with an abuse trajectory that predominantly starts in one's youth. 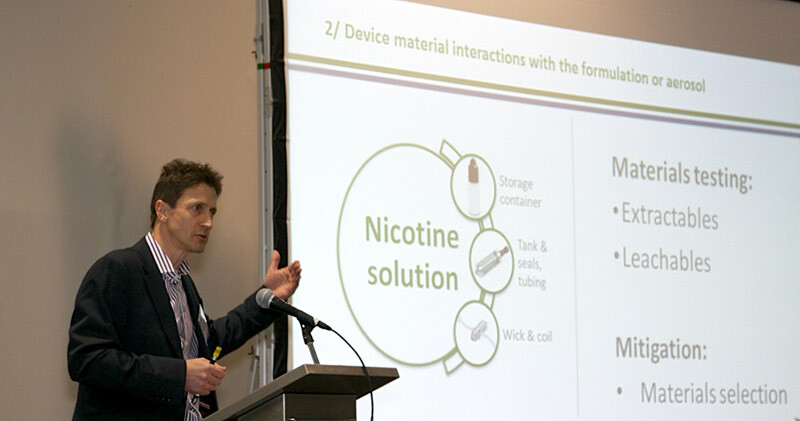 Electronic nicotine delivery systems have both promise and concern. But since cigarette smoking causes one in five deaths in the US every year, every approach to reducing cigarette smoking should be considered, and e-cigarette use by smokers attempting to quit is promising. 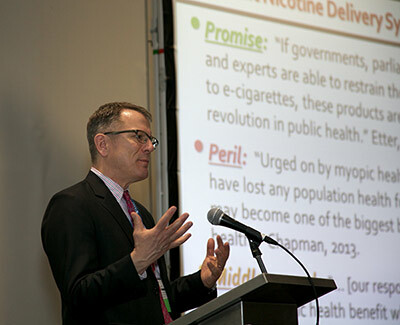 He showed a slide that demonstrated high rates of e-cigarette use in American teenagers: Approximately 9 percent of eighth graders, 16 percent of 10th graders and 17 percent of 12th graders reported use of e-cigarettes and more than one fifth of these e-cigarette users reported they had never used tobacco previously. He said that since the key to nicotine addiction seems to be adolescent exposure, keeping e-cigarettes away from teenagers is important. There are no nationwide regulations of e-cigarettes in the US. Last year, the Food and Drug Administration (FDA) proposed rules to regulate e-cigarettes that would ban their sale to children under 18 years and prevent manufacturers from making health claims about the products while studies of their safety are ongoing. In addition, the FDA wants to ban the distribution of free samples of e-cigarettes and vending machine sales. Dr. Compton is leading an effort jointly sponsored by NIDA and the FDA's Center for Tobacco Products to field a large-scale longitudinal population study to assess the impact of new tobacco regulations. The study includes 45,995 people in the US ages 12 and older with yearly data collection from study participants, including both surveys and biological assessments of tobacco exposures, risk factors and health outcomes. He said they finished baseline data collection in December and are preparing data for publication now. 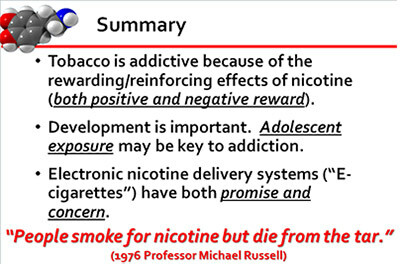 So as a physician knowing that we don't have complete knowledge on the safety of e-cigarettes, would he advocate people use them rather than smoke traditional cigarettes? I asked Dr. Compton that question at a similar panel last year at the European Open Science Forum in Copenhagen, and he said: "I would be delighted if every cigarette smoker switched to e-cigarettes. We know that tobacco smoke kills. There is no debate about that." Dr. Bridgman of Nicoventures said the quality control made possible by industry is a good thing. There is growing consensus among public health professionals that e-cigarettes are significantly less risky than conventional cigarettes. We believe that, in order to realize their full potential, e-cigarettes should be regulated to ensure appropriate quality and safety standards, whilst also allowing sufficiently wide retail availability, appropriate lifestyle positioning and flexibility for the rapid introduction of product innovation. When asked if doctors should be prescribing e-cigarettes to their smokers, he said they should start with licensed products. After that they may have a place, but "a blanket endorsement for all these e-cigarettes is a bit too soon. I will be calling for international recognized standards around these products so we can build (consumer and healthcare professional) confidence." The study found that cigarette smoke reduced cell viability to 12 percent at six hours, whilst a standard e-cig showed no such decrease and displayed results similar to untreated air controls. The paper is under review for publication, he said. Don't stamp out a "tremendous public health opportunity"
Over one thousand people will die worldwide from tobacco during this 90 minute session alone, E-cigarettes have the potential to dramatically reduce this deadly toll. She added that research done by ASH and official British Government statistics found that e-cigarettes use is rare among non-smokers, and there is no evidence that e-cigarettes are acting as a gateway drug to smoking, as opponents of e-cigarettes claim. "There is no evidence from the UK that the growth in e-cigarette use is leading to an increase in smoking, particularly among young people," she said. "In fact smoking rates continue to fall." There is a danger that the precautionary principle is being used to deny smokers access to products which can save their lives. Although the panelists noted that nicotine is an addictive drug that can stimulate the nervous system and increase the heart rate and blood pressure, they said the dangers of smoking cigarettes come mainly from the tar and toxins in tobacco. In the ensuing discussion, Dr. Thomas Hartung, Chair of Evidence-Based Toxicology at Johns Hopkins University, said the approach to safety testing was key less we stamp out "a tremendous public health opportunity." E-cigarettes are a tremendous public health opportunity, which we can easily block by applying traditional toxicity testing. If you insist on this, you are essentially killing off the sector. Flavors added to some e-cigarette brands such as popcorn or bubblegum or even gin and tonic are a big issue, and one wonders why they are there. What is safe in food is not safe if inhaled. We need data fast, but we must re-think how to go about it, as traditional toxicology is not fit for this purpose. "Killing Me Softly or Our Greatest Public Health Opportunity?" While there is still evidence to be gained about the safety of e-cigarettes and debate over testing methods and how they should be sold and marketed, experts seem to agree that they are still better than cigarettes and their potential for public health benefits should be explored. 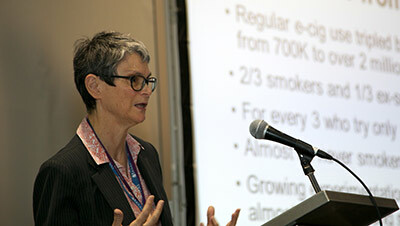 If we do not step forward and consider bold actions such as embracing the potential of e-cigarettes and other harm reduction agents then we, and the next generations, may have to confront the challenge laid down by former World Health Organization Director-General Dr. Gro Harlem Brundtland when she said: "If we do not act decisively today, 100 years from now our grandchildren and their children will look back and seriously question how people claiming to be committed to public health and social justice allowed the tobacco epidemic to unfold unchecked." David Levine (@Dlloydlevine) is co-chairman of Science Writers in New York (SWINY) and a member the National Association of Science Writers (NASW). He served as director of media relations at the American Cancer Society and as senior director of communications at the NYC Health and Hospitals Corp. He has written for Scientific American, the Los Angeles Times, The New York Times, More magazine , and Good Housekeeping, and was a contributing editor at Physician's Weekly for 10 years. He has a BA and MA from The Johns Hopkins University. Are e-cigarettes luring teens into tobacco use?